I felt like having a bowl of very flavorful curry the other day. I haven’t had curry for a long time. So I made chicken pumpkin curry with homemade Thai yellow curry paste. When I first moved to Buenos Aires, there was a lady from Indonesia living in our neighborhood. 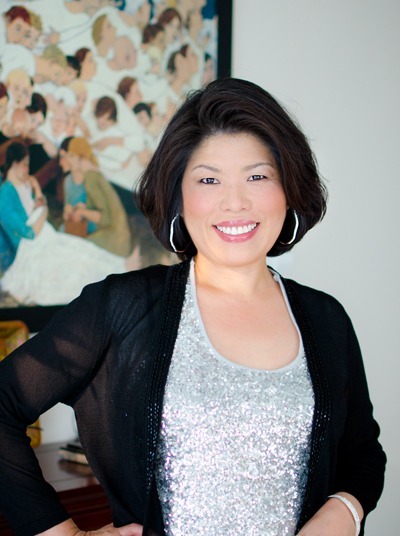 It was very rare to see SE Asian people in the southern hemisphere and I was hoping to get to know her better. Unfortunately she and her family were getting ready to move back to their home country soon after my family arrived. She gave me the lemongrass plant that she planted and grew in her backyard. All she said to me was just to plant them where there is plenty of sun, and they will grow by themselves. No need to give extra care. I followed her instructions and voila~! The lemongrass plant grew so tall, they covered my kitchen window half way up. 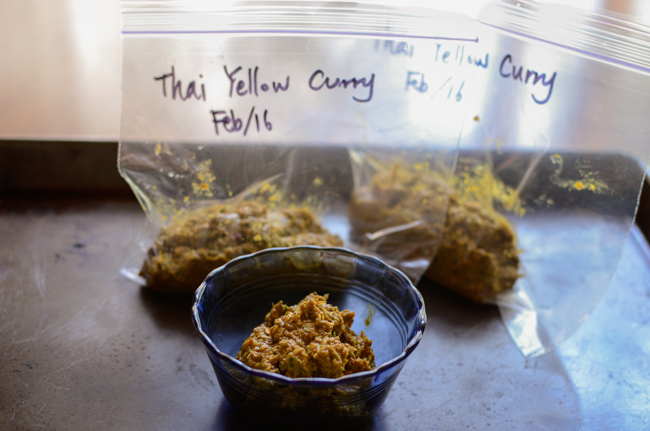 I pulled a few lemongrass stalks and made yellow curry paste with them. I should have made Indonesian curry paste to tribute the Indonesian lady, but decided to make Thai version first. The Indonesian curry paste will come along soon. To make Thai yellow curry paste you will need dried red chilies, shallots, garlic, ginger (galangal), lemongrass, and other various spices. I wrapped ginger, garlic, and shallow separately with foil and roasted in a hot oven to get the mellow flavor. 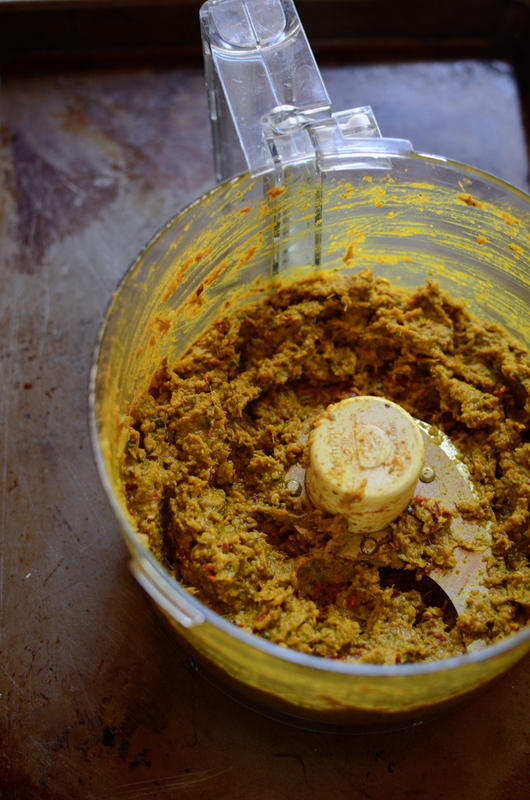 Making homemade yellow curry paste is not difficult at all. I am not a curry expert by any means, but I was able to whip up a decent curry in no time all made from scratch. I am proud of that. Who wouldn’t want a chicken curry made from scratch? The usual partner of chicken in Thai yellow curry is potato but I used pumpkin instead this time. 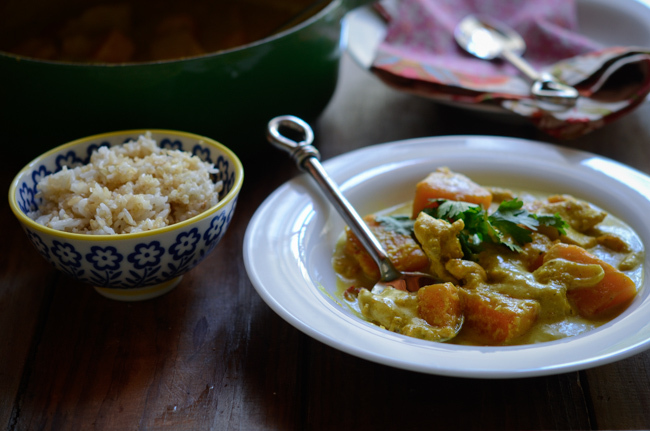 The pumpkin brings mellow and sweet flavor to the curry. 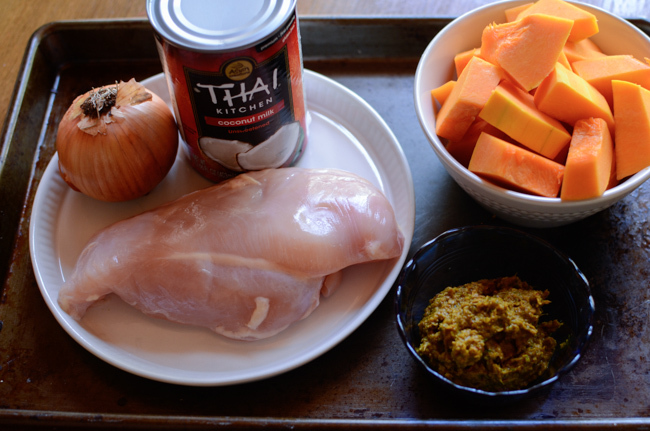 To make the chicken pumpkin curry, you only need chicken, pumpkin, onion, coconut milk and a good Thai yellow curry paste. That’s all. You can add chicken stock if you prefer thinner curry base. I prefer mine thick this time. Saute the onion until soft, add bite size chicken and pumpkin, then toss with the curry paste. Pour the coconut milk and let it simmer until everything is nice and soft. How simple is that? 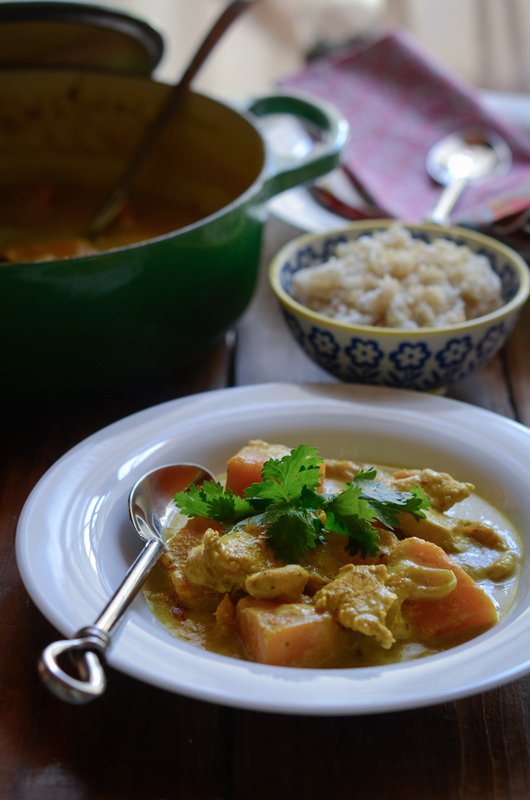 My made-from-scratch chicken pumpkin curry with homemade Thai yellow curry paste was served with multi-grain rice. The wholesome meal was simple and hearty, my longtime craving of good curry was well taken care of, and I was able to enjoy every bite. It was mellow and almost sweet due to the pumpkin. The recollection of the sweet memory I had in Thailand instantly came back to me as I was savoring the curry. How nice! 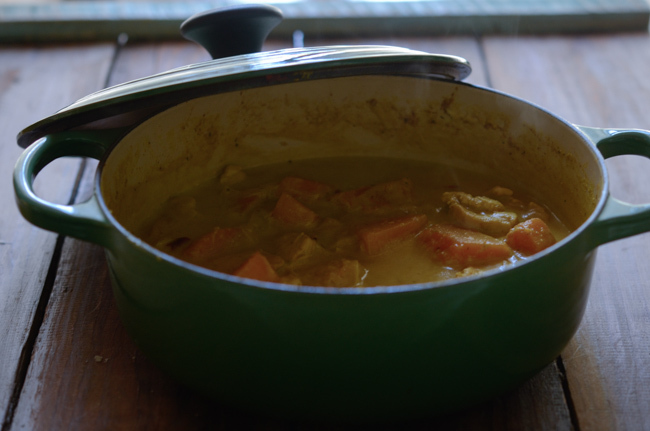 To make the yellow curry paste; Preheat the oven to 400˚F. Soak the chili in warm water for 15 minutes. Take the chilies out and reserve 2-3 tablespoon of the soaking water. Prepare 3 pieces of foil to wrap shallots, garlic and ginger separately. Wrap them and seal the edges, and place them on a baking sheet. Roast them for 30 minutes. You will need to remove the ginger in 10 minutes after you put in. Squeeze out the roasted garlic from its skin, throw in a food processor along with shallots, ginger, chilies and the rest of the ingredients. Process until they become smooth paste. Set aside. To make the curry; Heat 1 tablespoon oil in a pot over medium heat. Saute the onion until soft. Add the chicken, pumpkin, and 1/3 of the yellow curry paste and toss to coat well. Add the coconut milk and stir well to incorporate. Cover the lid and let it simmer for 15 minutes. Season the curry with fish sauce according to your taste. Sprinkle with cilantro and serve hot with rice. 1. If you prefer thinner consistency of curry, add 1 cup of chicken stock as you simmer. 2. The curry recipe uses only 1/3 of the yellow curry paste. Store the leftover curry paste in a zilp-lock bag and keep in the fridge for 1 week or 2-3 month in the freezer. When we lived in Florida we grew lemongrass in our garden. Truly easy to grow -- almost like a weed! Anyway, this is such a terrific looking recipe. Love curry! And with pumpkin? Great idea! Thanks so much for this. I know. 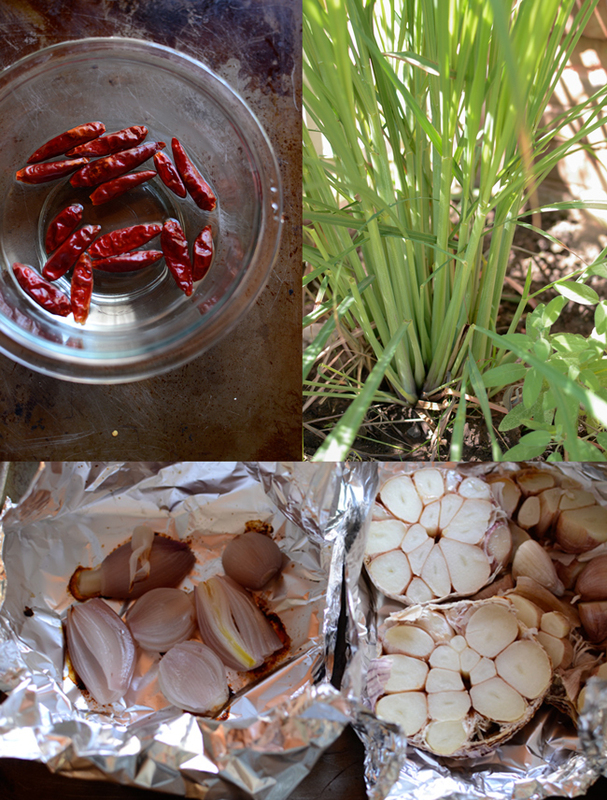 I never thought growing lemongrass is this easy. All you need is to plant on a sunny spot and water occasionally. It grows like a weed as you said. Growing lemongrass was easier than I thought. They grow like a weed! I like the chicken with pumpkin in curry. It adds sweet mellow flavor. Thanks, Julie. Homemade curry paste is very easy to make and it is worth the trying. Hi Holly, I have to try this recipe soon! You are right about lemongrass. They are easy to plant and lend its flavor to so many dishes. I would love to have a lemongrass plant in my yard. How fabulous. Fresh lemongrass is hard to find where I live. This curry looks amazing! Will have to try making my own curry paste sometime! 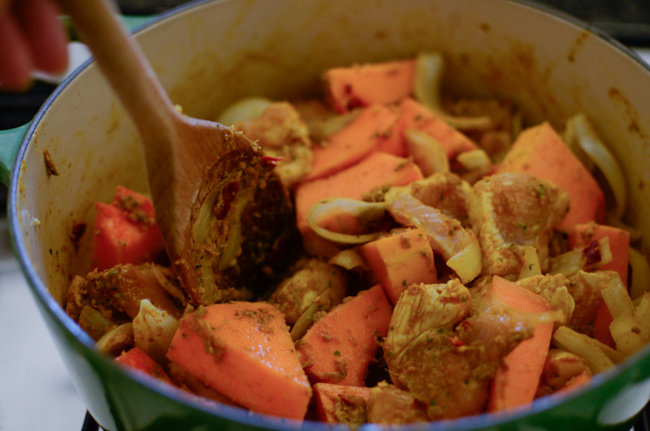 Your curry paste sounds so flavorful, and I love the addition of the pumpkin here! I love curries! But I've never tried one with pumpkin, I usually put potatoes and carrots.. I love thai curry paste but never made my own. Thanks for this awesome recipe. Will sure give it a try. Greetings from Singapore! 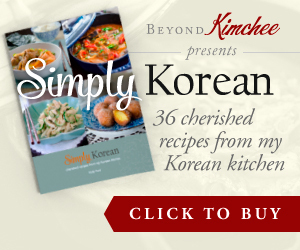 Love your blog so much that I come back from time to time just to read your next recipe! A tip: to enhance the curry flavor, you can try pan frying the curry spices first before adding the rest of the ingredients. That's wonderful idea! Thanks for your tip, Evelyn.